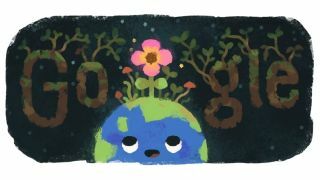 Google is celebrating the vernal equinox with Google Doodles illustrating the start of spring in the Northern Hemisphere and the beginning of autumn in the Southern Hemisphere. Tonight's full moon occurs at 9:43 p.m. EDT (0143 March 21 GMT) and will be the third and final "supermoon" of 2019, according to NASA. The space agency describes supermoons as a full moon that occurs near perigee, the closest point to Earth in the moon's monthly orbit. So, celebrate the first day of spring (or fall, if you're in the Southern Hemisphere) with a look at the "Super Worm Equinox Moon" tonight! Editor's note: If you capture an amazing photo or video of the Super Worm Equinox Moon and would like to share it with Space.com for a story or gallery, send images and comments to spacephotos@space.com. March Full Moon 2019: Spring Equinox Brings the 'Super Worm Moon'!